This post concerns taphonomy = the scientific evaluation of what happens to shells and other organisms after they die. Taphonomy provides very practical information as to whether or not an assemblage of fossils (e.g., a layer of fossil shells) represents a life assemblage = the fossils died exactly where they lived in their original environment, or if it represent a death assemblage = the fossils have been moved by currents and or waves after death to a different spot from where they originally lived. A life assemblage is also called an in situ assemblage. A death assemblage is also called an exotic assemblage. 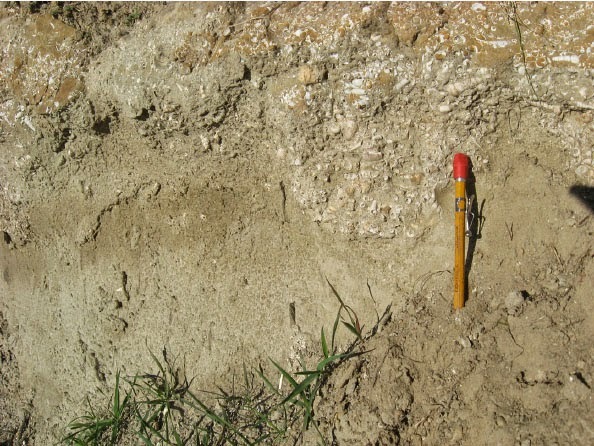 The following photographs show examples of both assemblages. In the middle of this photograph, there is a life assemblage of boring clams of late Pleistocene age (slightly older than 47,000 years ago) in southern California. The man's finger is pointing to a clam consisting of both valves and in its original life position. The clams lived in a rocky shoreline environment and bored into a deep-marine siltstone of Miocene age (about 6 to 7 million years old). The layer of shells directly above the boring clams represents a storm deposit that buried the boring clams. It is a death assemblage consisting of shells transported and deposited at this site about 47,000 years ago. Its clam shells are all single valves that were deposited after death in a horizontal position. This photograph shows a life assemblage consisting mainly of the large oyster Crassostrea titan. They consist of both valves that are closed together in their original living position; in this case, vertical. 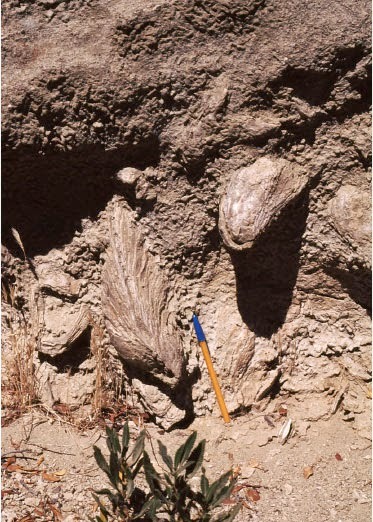 The oysters formed a bed, one-oyster thick that lived in very shallow-marine waters in central California during the late Miocene. 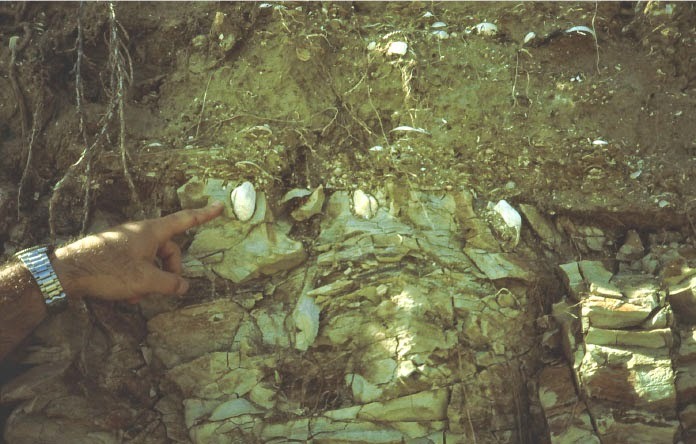 The turritellid shells shown in above photograph were transported and deposited at this site by wave action; note that they show preferred orientation. The species is the middle Eocene Turritella andersoni lawsoni, which was discussed in one of my earlier posts. 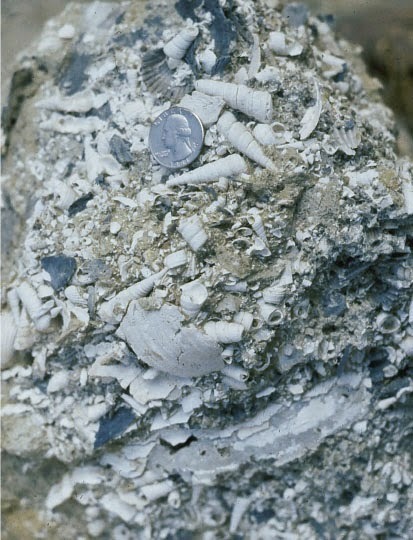 The above photograph shows a death assemblage of late Pliocene mollusk shells that were transported and deposited after death as a result of a storm deposit with local channeling into the layer beneath it. The larger shells are Turritella cooperi, which was discussed in one of my earlier posts. 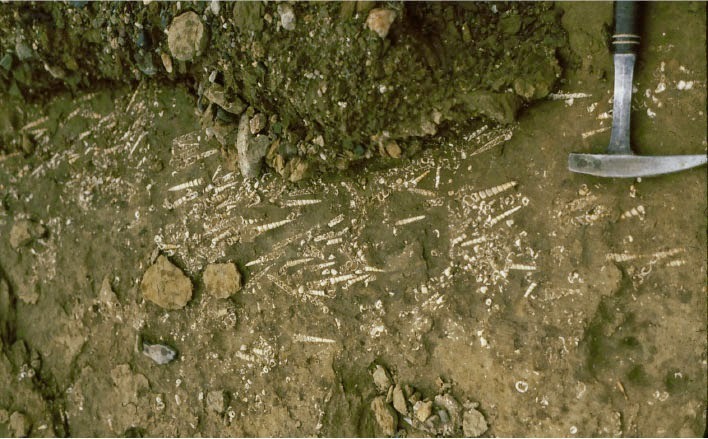 The above photograph shows a death assemblage of late Pliocene mollusk shells that were transported and deposited after death as a result of a storm deposit. Turritella cooperi, which was discussed in one of my earlier posts, is readily identifiable, whereas most of the other shells are too broken up and constitute "fossil hash." Gari texta, an Eocene burrowing clam, 35 mm long. This last picture shows a "butterflied" clam, called such because both valves are flattened out. Burrowing clams shaped like this one easily fall apart, because the valves get separated by even weak waves or currents. This particular clam, however, died near where it lived. Its "butterflied" condition indicates minimal transport after death. Good explanation of taphonomy and examples. Thanks for sharing your interpretation about founded fossil shells.